The Baku 2015 inaugural European Games has entered into the history of sports in Europe. The first European Games set the bar for the new continental sporting competitions that will be held in Europe once in 4 years. European sports officials admit that the sporting event held in Baku on June 12-28 was not any less important than the summer Olympic Games. 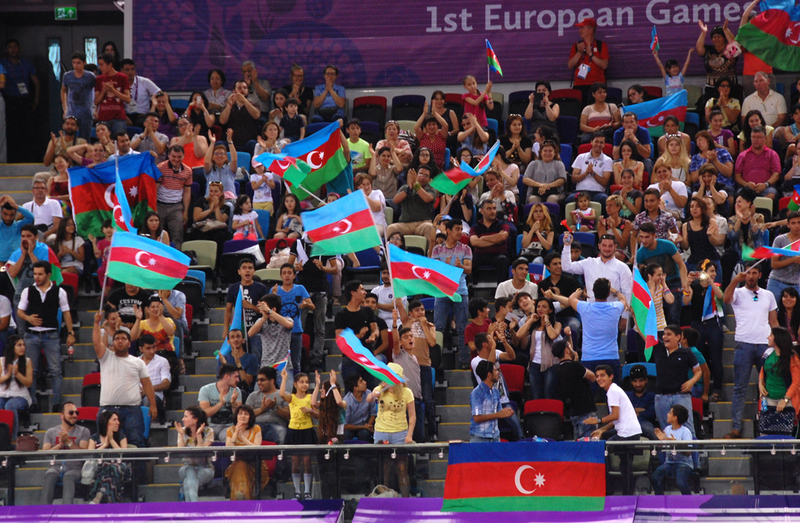 The Games have positively affected the pride Azerbaijanis have for their country and more so their athletes, according to a nationwide poll conducted by the Rey Monitoring Center on July 1-3. The survey, covering 1,500 respondents aged 18 years and older, reports that the closing ceremony of the first European Games in Azerbaijan was met with the same enthusiasm as the opening event. Ninety-four percent of the population named the results of the national team successful, while only one percent said that the national team performed unsuccessfully. The remaining 5 percent were undecided on the issue. Meanwhile, 63 percent of respondents noted that the performance of Azerbaijani athletes has surpassed their expectations, and 27 percent said that the performance of the national team was in line with their expectations. Only 1 percent was dissatisfied and 9 percent was undecided on the issue. Answering the question "In what sport could Azerbaijani athletes do better?" 23 percent of respondents mentioned wrestling, 16 percent said volleyball (mostly female), and 20 percent said other sports. 31 percent of respondents were undecided. Seventy-nine percent of those polled noted that they watched the closing ceremony. 91 percent of them watched the closing show live on TV, 1 percent had the pleasure of seeing it directly at the National Stadium, and 8 percent viewed it on the Internet. Seventy percent of respondents said that the closing ceremony aroused their sense of pride, while 12 percent said that they overall enjoyed the event. Only about 4 percent of the respondents reacted indifferently to Azerbaijan hosting the Games, and 3 percent did not experience any particular feelings, while only 1 percent expressed outright dissatisfaction. Twelve percent were undecided on the issue. A poll conducted by Rey from June 13-15 immediately after the opening ceremony of the Games, showed that 80 percent of the population expressed their intention to follow the Games. The results of survey carried out after the Games reported that 88 percent of the respondents followed the course of events. The remaining 12 percent were not interested in sports. Twenty-six percent of respondents named Paralympic champion Ilham Zakiyev, who lit the Olympic Flame at the opening and won gold in Judo, as the hero of the Games. 9.3 percent bestowed the honor upon Togrul Asgarov, with the same percentage going to Rafael Agayev, 7.3 percent to Rasul Chunayev, 7.1 percent to Oleg Stepko, and 8.3 percent to other athletes. The remaining 34 percent found it difficult to answer the question. It was a well-known fact that an event of this scale would not be cheap. The survey found that 72 percent of the respondents considered hosting the first European Games in Azerbaijan not only as a sporting event, but also as an opportunity to present Azerbaijan to the world. For this reason, the costs of the Games were justified. Only 10 percent of respondents do not share this view and consider the costs of the event excessive. Eighteen percent were undecided on the issue. At the same time, 83 percent of respondents believe that the creation of infrastructure for the European Games opens up new possibilities in sports in the country and is a good investment for the future. Speaking about the information war that Azerbaijan was pulled into before the European Games, 72 percent of respondents said Azerbaijan had won it. The survey also showed that 86 percent of the population supports holding the Islamic Solidarity Games 2017 in Azerbaijan. Successfully organizing the first ever European Games in a short time and then broadcasting the Games to the world, Azerbaijan fascinated viewers not only in Europe but also outside of the old Continent with its spectacular opening and closing ceremonies and 17 days of Games, conveying messages of unity and peace to millions of people. Over 6,000 athletes from 50 countries gathered in Baku to compete in 20 sports. Russia won the overall medal count ranking with an unbeatable 164 medals, Azerbaijan came in second with 56 medals, followed by the Great Britain with 47 medals. Azerbaijani athletes, driven by the support of the nation, won 21 gold, 15 silver and 20 bronze medals.